As my blog title suggests, I’m slow… Slow on the bike, slow in water, slow on my feet. But that doesn’t mean I’m not trying to get faster. So when my good friend Katie at KatieRUNSThis announced she was doing a modified Couch to 10K program that focuses on improving speed, I knew I had to get in on it. Twitter is such a gateway drug for me. A tweet also got me involved in Rouge Orleans. 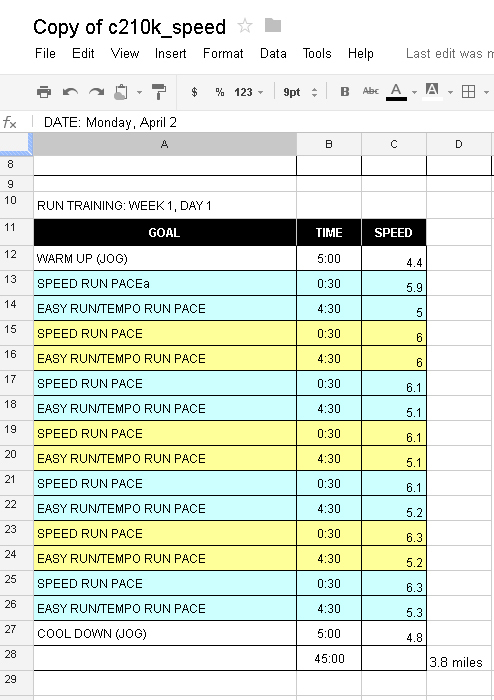 Last week, Katie posted the template training logs – one for speed and one for distance. It’s a 13 week program, so hopefully by the end of June I’ll be a leaner, meaner running machine… or at least up for running 10:00 miles on a regular basis. My usual running speed keeps me somewhere around 11:30 – 12:00/mile. I finished my last 10K (a PR) averaging 10:57/mile. It would be incredible to get that race time much, much closer to 1:00:00 flat. My first C210K workout went great! I completed Week 1, Day 1 on Monday on the treadmill while lightning crashed outside. The first run went so well that I’m actually planning to skip ahead to Week 2, Day 1 on my next run. This is both so I don’t get too bored and so that I can be more in sync with Katie and the other runners who started a little earlier than me. Also in the mix is an Easter weekend visit to my parents’ house, the potential for rain tonight scuttling my bike ride (in which case the alternative plan is painting a room in my house and cleaning), and the usual craziness trying to thwart my plans. This entry was posted in Running and tagged C210K, running, training, workouts. Bookmark the permalink. Soooooo excited about this! I’m *already* behind on Week 2 since O has been sick as a little pup this week (I’ll tell you more about that later). However, the week is not over yet and I will figure out how to get it done this week! W2D1 today, W2D2 tomorrow, XT on Friday and W2D3 on Saturday and I’ll be caught up again. That’s what I did last week and I could feel it in my knees. I was hoping to spread the work outs out this week but with O being sick, I was consumed with all things vomiting and poop diapers earlier this week. Nice visual, yes? Have no fear, I’m getting back on it today! I’m super pumped too! Now it’s just a matter of finding time for three runs a week, a swim, at least one bike ride and a social life! I hope Baby Key feels better soon! He is such a cute little thing! Poop and vomit unfortunately come with the territory, though. You’ll rock #C210K, I have no doubt! I might need to get in on this speed work. Once my PT releases me to run again, I want to try to get my average mile per hour significantly down. I’m really excited about it.. The original Couch to 5K is what got me running, so I’m confident that a similar program that slowly builds up speed can help me out too… And if I lose 10 pounds in the process, bonus! Good luck with your program! I’m not that speedy either. When I used to do tri’s I was always a back-of-the-packer, but I still made it across the finish line and that’s what matters! I’ve lost that running feeling, but I think it’s coming back!